Small cage with canary used in testing for carbon monoxide after the Hollinger Mine fire on February 10, 1928 in Timmons, Ontario, Canada. Because humans cannot detect carbon monoxide unaided — it is colorless, odorless and tasteless — and because canaries succumb to the gas at lower concentrations than do humans, caged canaries were used as warning systems for miners. Although the popular phrase today is "canary in a coalmine," canaries were used in mines of any type where methane or carbon monoxide posed risks. Most such mines were coalmines, especially following fires, when carbon monoxide was especially common. Photo courtesy U.S. Mine Safety and Health Administration. 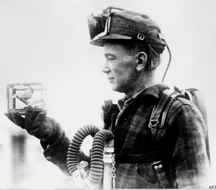 Until the 1980s, deep miners used canaries to detect carbon monoxide and methane. Canaries are sensitive to these gases, especially colorless and odorless carbon monoxide, which is toxic. Because male canaries sing almost incessantly, and because they tend to woozily fall off their perches before the gas concentration becomes toxic to humans, canaries provided both visible and audible warnings of danger. It was a valuable service, for which the canaries often paid with their lives. In the modern workplace, the canary in the coalmine is the person who first registers notice of an uncomfortable issue, such as bullying, ethical transgressions, unreasonably aggressive goals, or other abusive or risky practices. We're all sensitive to these things to varying degrees. Fortunately, someone else usually notices the abuses and risks we don't notice ourselves. We return the favor by noticing abuses and risks that others don't. Still, a difficulty arises when we've noticed something, and no one else has yet registered his or her notice: what to do? Here are some guidelines for being the canary. It's risky to be the first to register notice of abuses or risks. Even though the group might benefit from your action, it might still extract a price. The price is likely to be higher in more toxic political environments, and the price escalates with the degree of embarrassment to those with political power. But even if the political price is low, the price can be personal if your action brings harm to someone close to you. practiceswhether you're willing and able to pay the price. Since the price of surfacing what you think you know can be high, be certain that what you know is correct and complete enough to justify the risks you might have to bear. Validation can be tricky, because even asking questions can carry risks. But ambiguity can also supply protection. If a benign interpretation is possible, and you elect not to surface what you know, you might be able to say, justifiably, that you thought all was well. If you're aware of abuses or risks, and if you elect not to surface that knowledge, someone else might do so, or the situation might become self-evident. When the knowledge comes into the open, a natural question arises: who else knew about this, and why didn't they say something? Sometimes failing to surface the knowledge can be seen as disloyal, negligent, unethical, or even criminal. In some cases, you can be in jeopardy both for surfacing what you know, and for failing to do so. Would you like to see your comments posted here? rbrenlbIXjxGeRvrALsskner@ChacNyDfIaGPbQyOrLTmoCanyon.comSend me your comments by email, or by Web form. I offer email and telephone coaching at both corporate and individual rates. Contact Rick for details at rbrenAzgnmuzLxmJLySktner@ChacDFkNujHDADevLWAYoCanyon.com or (650) 787-6475, or toll-free in the continental US at (866) 378-5470.